In order to see the signals that are being transmitted over a satellite, or indeed over any radio frequency system, the most effective tool for visualising them is a spectrum analyser. A spectrum analyser displays a graphical representation of small portion of radio frequency spectrum. In a way this is similar to looking at a map of a country and zooming in to view a town, street and a house within that street. The display is made up of a 10 by 10 grid of squares just like an oscilloscope. The central verticle line represents the center frequency and either side is 5 vertical lines of freqency making up a span of frequencies. 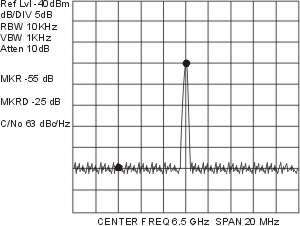 The horizontal lines represent amplitude in decibels. Each square is given a value by the user such as 5 dB per square or division for amplitude and say 10 MHz per division for frequency. The user chooses these settings in order to see the signals of interest and then measure them accurately. Other settings include Resolution Bandwidth and Video Bandwidth. Resolution Bandwidth (RBW) is the width of a filter that is swept across the selected Span of frequencies and this must be set to a value not less than the bandwidth of the signal you wish to view or it will not be fully captured by the filter and this will result in the signal being displayed inaccurately. Video bandwidth (VBW) is used to reduce the amount of noise displayed so that signals can be more easily seen and measured. A rule of thumb is to set the video bandwidth to a value of 1/10th or 1/100th of the RBW. This makes measurements easier to calculate in your head. The display above shows a signal at a center frequency of 6.5 GHz within a span of frequencies covering 20 MHz. The RBW is set to 10 KHz and the VBW is set to 1 KHz. The reference level is set to -40 dBm and this is the level of the base line of the display, the bottom line of the grid. The noise floor is 2 squares up from this and the dB/Div is set to 5 dB per division. Straight away we can see that the noise floor is at -30 dBm since the bottom line is at -40 dBm and the noise is 2 squares higher at 5 dB/Div. So now you can begin to see how these settings can be set to find and display a signal so that it be measured. In our next Tutorial we will look at how we can measure values for C/No and how that can be in turn used to verify a link budget.